Born in Manchester, England in 1956, Mariska attended Holy Child Secondary School in Cape Coast and St. Mary's Secondary School, Mamprobi, Accra. She then returned to the UK and attended Beresford College of English and Commerce, Margate, Kent and later Harrow College of Further Education, Harrow, Middlesex. She has a PhD in Life. She has two sons, Niinoi and Kwame. 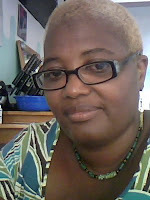 She is a motivational speaker, poet, writer, beautician, fire walker and lover of jazz, blues, reggae and old time highlife. 1. Your wish came true this year and the Harmattan did not come! How do you feel about this? I missed the Harmattan. I was looking forward to the cool weather after the heat and I think we had one day where it threatened after some heavy rains and we said, "It's coming oooooo." Alas it never happened and it made me realize that climate change was really affecting us. 2. When you were a child, did you have similar feelings about the Harmattan, or have your feelings changed as you've aged? When I was a child I didn't like it as much as I do now. I hated having shea butter or cocoa butter smeared over me and I had nosebleeds when the dryness came. 3. This is a very playful poem. Is there something about the Harmattan that draws that playfulness out of you? The sight of people in Ghana, a warm place with an average of 35 degrees, wearing thick winter jackets and cardigans with ashy white lips always made me smile. I called it "Ghanaian Winter." Just the change in people's mannerisms and the Fan Ice sellers trying to convince you that its not harmful to eat frozen yoghurt while the biting wind was going through your bones! 4. What drew you to writing this poem in short-lined couplets? It seems to be a popular style these days amongst Ghanaian writers. I wrote in short-lined couplet because that is how it came to me. 5. Is there anything new going on in your life/writing that you'd like to share with our readers? Still looking for a reasonable priced publisher for my three completed books. This is indeed a very good poem. It brings out all the nostalgic familiar feelings of the harsh harmmatan season. The use of imagery is very vivid. I remember very well the terrible feelings you get when your cracked feet become a nuisance and stick to the mosquito nets at bedtime, how cautious you get when you want to laugh heartily lest you get your lips cracked at the thin line in the middle. Thanks for sharing, Mariska.I have always enjoyed all your works. Lets have some more, please.